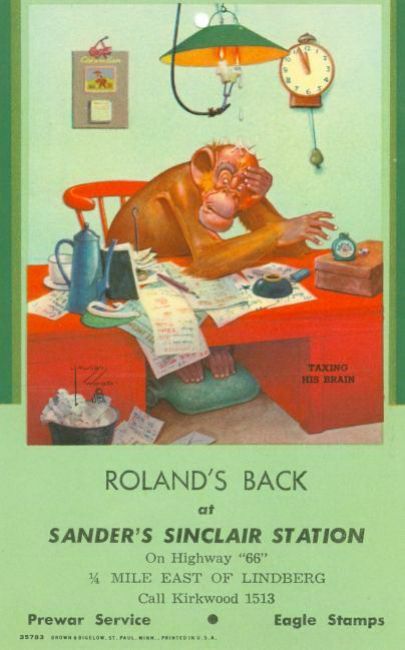 Roland Sanders’ Sinclair Station was located just east of Lindbergh at the time these whimsical postcards were issued. (No relation to the current Sanders Service at 10775 Watson) Sanders’ Sinclair was later relocated to 9945 Watson. The cartoon drawings are by British illustrator Lawson Wood, and feature his character Gran’pop the ape. Gran’pop was slated to star in his own animated films but the project stalled during World War II.